I have found out about this forum when trying to find some help with a 25mm module I am looking for. 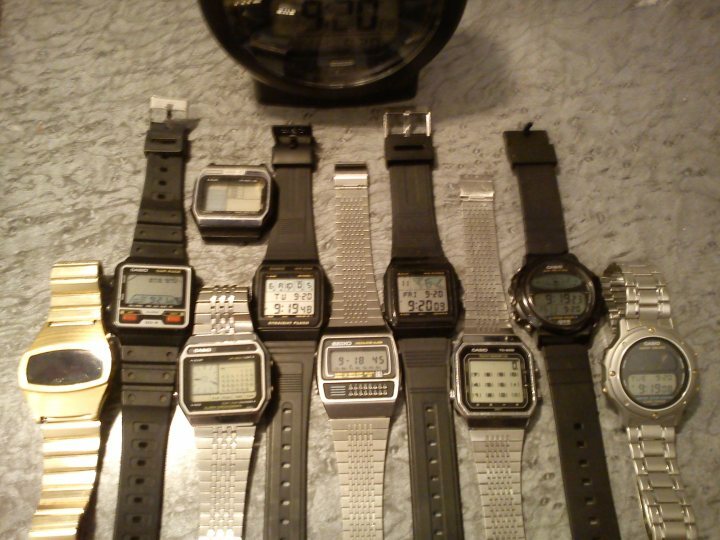 I am delighted to have found a community of people who share my interest in Digital watches of all sorts, so I would like to share with you my collection, small as it is for now! I have also made short videos demonstrating some of these watches on YouTube - they include subtitles to make them easier to follow. Can't believe it's been nearly 2 years since I started this topic. Anyway, my collection has grown - including some non-digitals. Thanks, it's nice to know you're getting enjoyment. I have watched a couple of the video's and enjoyed them very much and I am looking forward to watching the rest. This is really useful tutorial material for the forum Members to find out information about there vintage watches. I really like seeing this because it does help somewhat. So thank you "Caruso". My latest addition, a Casio A201 with the 103 'Blue Thunder' module. 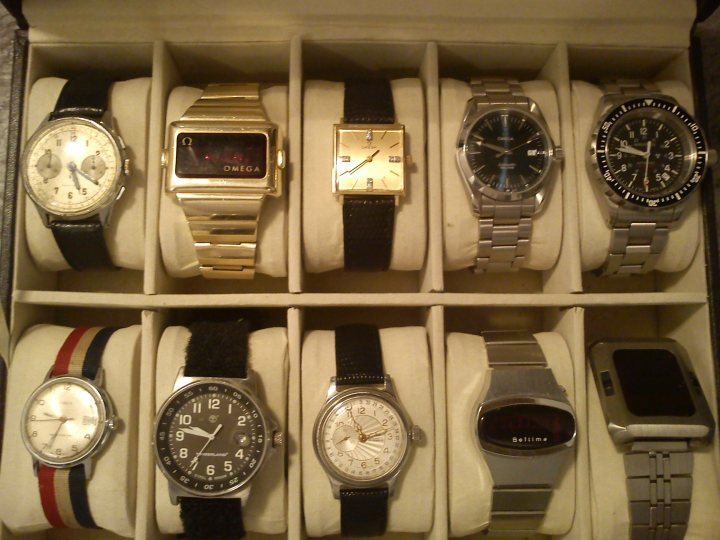 What a great collection of watches! A great welcome! And your youtube movies are a very welcome trigger to all the new people who might get interested in digital watches, as well as those that are still collecting. Thanks! 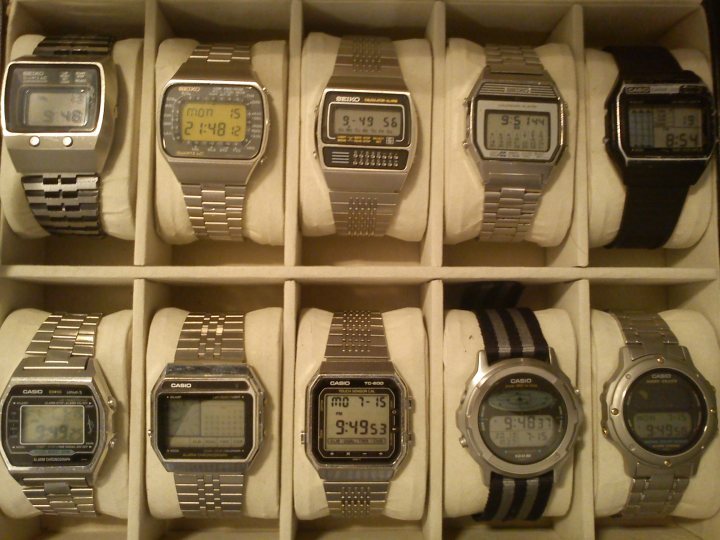 Boy they are all nice, but the one I enjoy the most is that Casio moon graph. I got mine in the early '90s from a sky and telescope magazine and wore it for years while in high school before it was stolen. Good memories seeing that watch. It's nice to know people are appreciating my videos, so thanks for your kind words. I do worry that in 100 years time these videos will be the only way to see these fine watches in action. Hopefully not, but I do make them just in case. The mods have kindly stickied this topic and I'm going to add a load of new videos that I've not previously posted. So I'll kick off with my vintage digital pride & joy, my Omega Speedmaster Professional LCD. Refills, time setting and battery compartment on the Kent. The next 3 are all astronomy related. Casio Cosmo Phase watch and the clock version too.